What do you imagine of Thailand when you think of the country? The beaches in the sunshine, night clubs with dance of the lady-boys, fabulous spas and massages or the incredibly amazing creature – Thai elephant. Yes, any one of them could represent Thailand. Thai elephant is the national animal and it has played a very important role in Thai history, and has contributed immensely to Thai culture. It symbolizes strength, durability and longevity. It is the symbol of Thailand. There are two species of elephants in the world. One is Asian elephant, the other is African elephants. Asian elephants are divided into four subspecies, Indian, Sri Lankan, Bornean and Sumatran. The Thai elephants belong to Indian elephants but they are slightly different from them. You can identify them very easily because they are much smaller than other Indian elephants and they have shorter front legs and a thicker body. In the early of 20th century, there were estimated 300,000 elephants in the wild plus 100,000 captive elephants in Thailand. Tragically this number has declined dramatically, until the year of 2007, there were an estimated 3,456 captive elephants and roughly 1,000 wild ones. Many of the male elephants were hunted and poached for the ivory in their tusks. Thai elephants became an endangered species in 1986. Thai people have a long and shared history with Thai elephants and the elephants have played a very important role in the history and Thai societies since the late 1200s. They were captured and trained to be a tool for war, or do heave labor or transport logs in the forest because of their sheer size and strength. What more they have been royal iconography since King Ramkhamhaeng the Great of Sukhothai. Known as the intelligent, strengthen creatures with an individually distinctive personality, Thai army had used elephants as a tool for war for hundreds of years. They were regarded as a warm-blooded armored-tank. Male elephants that were aggressive but can be tamed were selected to be elephants tank. They were trained to go forward by pricked on their skin with spear in a loud environment of shouting and drum sounds to accustom them to the sounds of the battle. The elephants and Thai royals established a relationship firstly recorded in the stone inscription of King Ramkhamhaeng in Sukhothai period. According to the inscription, the elephant of the king called Chao Praya Prabhongsawadee save King Naresuan, the father of King Ramkahambaeng in the war with the Burmese when his soldiers fled in fear. For a quite long time, when a white elephant with good build was found, it was to be present as property to the king of Thailand as a law. The white elephant was regarded a royal symbol. They are not albinos but genetically different and they are not really white but they are a dusky pinkish grey. Elephants in Thailand were trained until around 10 years old then they were ready for real work and they did not retire until the age of 60. Today, logging is illegal in Thailand, then lots of mahouts with a huge burden of taking care of the elephants without the reliable source of income. They have to find other ways to feed their elephants, so most of elephants were trained to do performance to entertain visitors in circus and zoos. They were trained to play soccer, paint with their trunk, and lift heave objects with their trunks and participate in talent shows. With the development of tourism, Thai elephants were forced to take tourists trekking through the jungle and perform in front of crowds. Until June 17th 2010, laws were passed for elephant protection. Elephants working in the entertainment industry are trained to follow over forty commands. Elephants in Thailand are considered to be very important in their culture. As Thailand is a Buddhist country, elephants are portrayed as sacred animals because of their special symbolism in the practice of Buddhism and their close relationship with royal family. There are many elephant's references to works of art, literature and national emblems. Paintings and drawings can be found on the walls in Buddhism temples and Thai royal palaces. Between 1843 and 1917, Thailand's national flag contained a white elephant in the middle of a scarlet background. Now the flag of the Royal Thai Navy has the portrait of the white elephant. What more, the elephant is also a part of the official emblems in many provinces of the country. Elephant is the symbol of Thailand, so you can see them at many festivals and events. 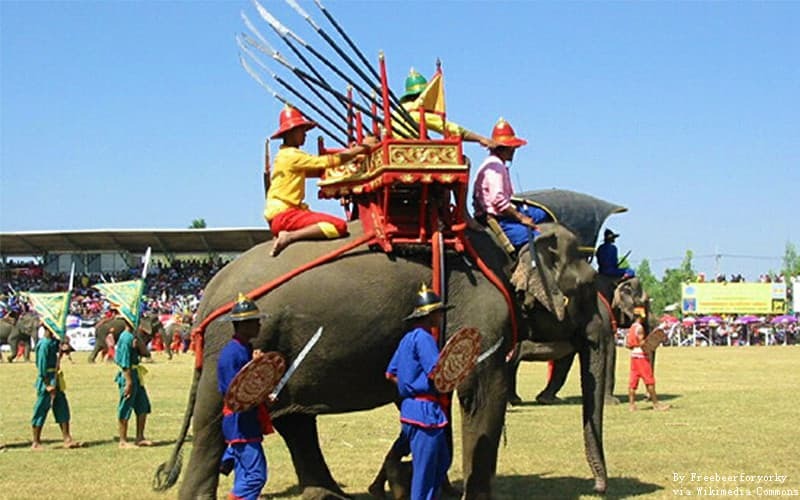 Thousands of Thais flock to the Surin Elephant Round-up on the third weekend of November to take party in ceremonies and watch hundreds of elephants play sports. Lots of Polo players come from all over the world to visit Thailand during King's Cup Elephant Polo Tournament held in Bangkok and they will ride on these animals and play the sport. After the logging injunction issued, the elephant owner-the mahouts had lost their stable income and the high cost of feeding an elephant became a huge burden of them. They had to find other ways to feed the elephants, so most of them turning to the entertainment and tourism industries. Thai elephants really drew a lot of attention from all over the world and many tourists come to Thailand in hopes of riding the elephants to go through the jungle and enjoying the performance of the intelligent and cute animal. This in fact has prevented the mahouts becoming poverty, while the elephants endured the torture until broken into submission during the training. At present, there are over half 3,000 captive elephants in Thailand are used for tourism or are put to work and the living conditions are not always good to them. In most places where you ride an elephant, there is a metal cage on its back and the bars of the cage are dig into its back. As it is not the best place for them to bear weight, it caused wounds and sores never have a chance to completely healed. Perhaps that is the biggest reason against elephants riding from animal protect experts. Because of the protection actions leaded by the Thai government, the population of wild elephants has risen. However, the conflicts between the elephants and farmers also have been risen, as the elephants searching for food, sometimes eat farmers' crops. The government announced that it would try additional methods to reduce the conflicts by providing more food sources for elephants, compensating farmers whose crops have been damaged by elephants what more the buffer zones will be built between the communities and elephants. Due to the dramatic drop in numbers of the elephants, the deep concertation for the survival of Thai elephant from all over the world nowadays, there are a number of Elephant ethical sanctuaries and nature parks have been established in Thailand in order to save and rescue the elephant from being abused. Thailand also legislate to protect wild elephants. Now the biggest wild populations are found in Khao Yai National Park, the Thuang Yai and Huai Kha Wildlife Sanctuaries and along the Myanmar border. If you like to interact with the elephants on your trip to Thailand, please never go to a park that advertises shows, unnatural behavior, tricks or painting, and do remember that do not ride them and please ensure the place you are visiting that they are treating the animals ethically. 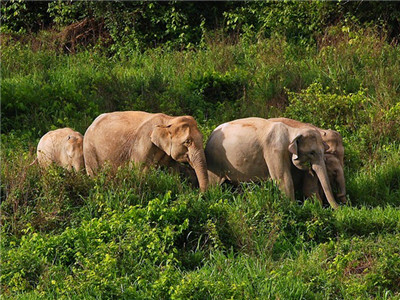 UME Travel has some recommended elephant sanctuaries for your reference. Elephant Nature Park in Chiang Mai which is an elephant rescue and rehabilitation center in Northern Thailand. You can volunteer and visit to help. It is very rewarding experience especially a family and for children. The park has been involved in dozens of rescues which have created their thriving elephant herd. The park provides a natural environment for elephants, buffaloes and many other animals under their care. In the park, visitors are allowed to interact with the elephants in a positive way. Patara Elephant Farm is working to breed elephants and their eventual goal is releasing the elephants into the wild and rebuild the wild elephant populations. 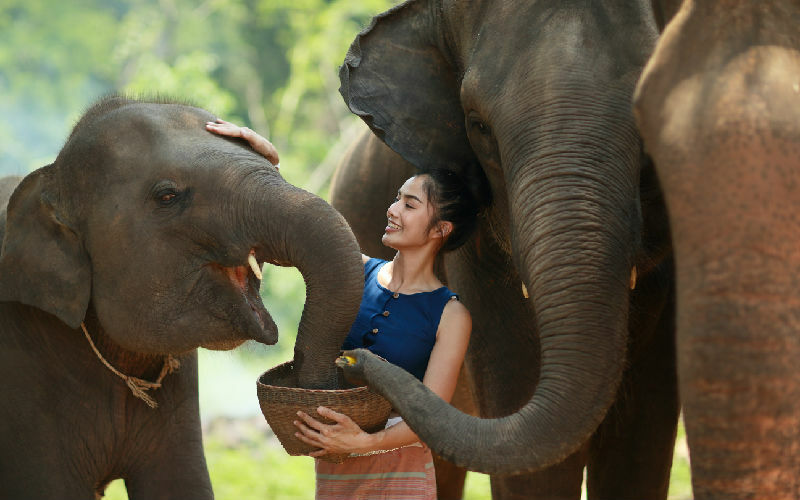 Other ethical elephant sanctuaries include Elephant Jungle Sanctuary in Chiang Mai, Phuket and Pattaya; Boon Lott's Elephant Sanctuary and Wildlife Friends Foundation Thailand. Throughout your visit at the elephant sanctuaries, you will do a lot of positive activities with elephants. You will bath, play with and even feed them. The most important is that you will learn as much as possible about the elephants and understand why it is important to protect them.